The Abrams movies take place in a new timeline (the Kelvin Timeline) for the most part, which is meant to be canon within Star Trek's overall continuity. Yet, the redefinition of events and characters and the radical redesign of the sets, props and ships disconnect the new timeline from the existing Star Trek continuity. This is why the "Star Trek (2009)", "Star Trek Into Darkness" and "Star Trek Beyond" starships are in "confinement" at EAS. It may be objected that the Narada should be moved to the "regular" section of this database, because the ship predates the timeline tampering. However, for reasons of overall consistency and transparency, this page shows all alien "Abramsverse ships" that appear in the three movies, rather than the "Kelvin timeline" ships in a narrow sense. 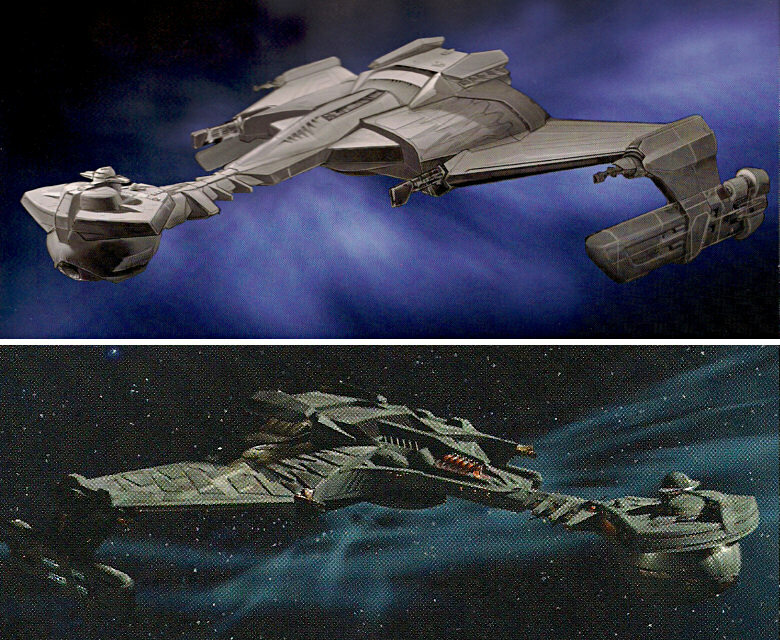 This is a small Klingon patrol ship with moving wings similar to those of a Bird-of-Prey, and a cockpit window at the very front tip. D4s are built for atmospheric flight and are quite maneuverable but not heavily shielded. We can see three ships of this type, designed by James Clyne, in "Star Trek Into Darkness", all of which are destroyed by Khan. This D4 should not be confused with the much bigger D4 that Rob Bonchune built during the run of Star Trek Enterprise, but that unfortunately never appeared on screen. 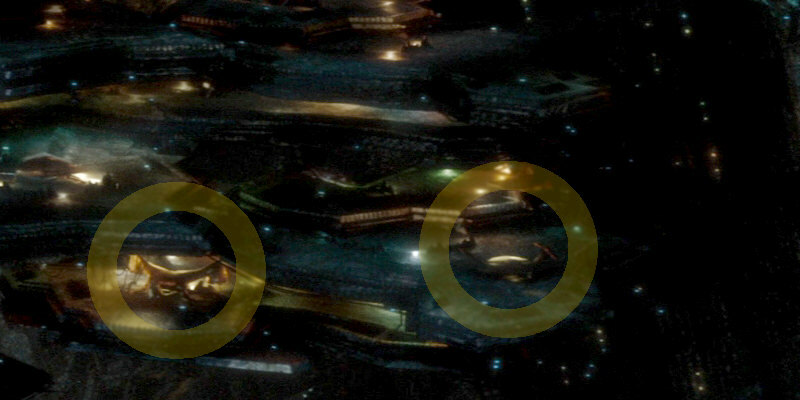 These ships appears in the Kobayashi Maru scenario of 2258. We should assume that it is an authentic Klingon ship type. The Klingon ships of the Kobayashi Maru scenario (apparently six altogether) look similar as the K't'inga or D7 from the Prime Universe. Besides additional details such as four forward-mounted disruptor cannons and several "winglets" on the bridge module and the neck the overall proportions may not be quite the same. Another change is that the outer rim of the forward section is now sloping down instead of vertical. Star Trek: The Art of the Film depicts a concept sketch and the purported final model used in the movie. The ships are somewhat smaller than the Kobayashi Maru. 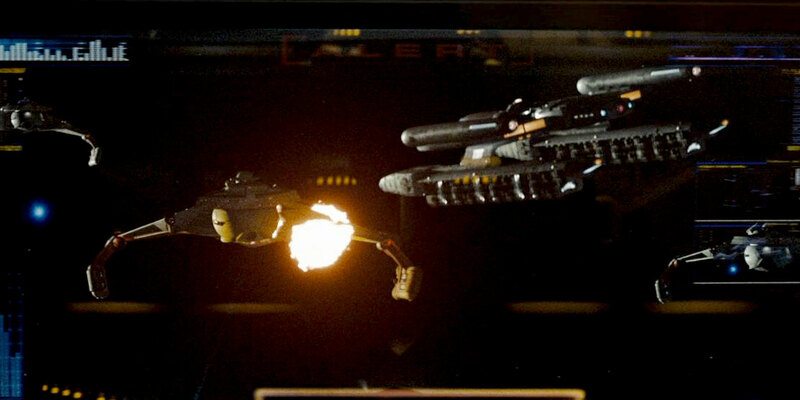 The Klingon vessels are consistently called "Warbirds" in this movie, on displays and in dialogue. The Narada purportedly took down a fleet of 47 "Klingon Warbirds". Klingon ships were previously called Warbirds only in ENT: "Broken Bow", and Brannon Braga freely admitted that it was in error. But there's no information that would be more persistent than false information. The K'normian trading ship is a small disk-shaped civilian vessel, capable of interplanetary and atmospheric flight and apparently unarmed. It can carry a crew of at least five. Kirk, Spock, Uhura, Hendorff and another officer take this ship to Qo'noS where it turns out quite maneuverable. The ship was "confiscated in the Mudd incident". This refers to the non-canon comic Countdown to Darkness, where a Bajoran-looking woman named Mudd delivered weapons to a faction on the planet Phaedus. This massive starship from the late 24th century used to be a Romulan mining vessel. The Narada is operated by a Romulan called Nero. It is equipped with a drilling platform on an extendable tether, capable to drill deep into a planet with a high-energy beam. The Narada is heavily armed, including a large number of missiles. In 2387, when Nero goes after Spock, the Narada is drawn into an anomaly and emerges in the 23rd century. It is not built for time travel in the first place. The design is radically different than traditional TNG era Romulan design, and it looks like an octopus with hundreds of highly irregular tentacles. It must be a couple of kilometers long, seeing how easily the USS Kelvin on ramming course fits inside. The CGI has purportedly been scaled to 5 miles length, with a drilling cable of another 5 miles. There is no good explanation why the cable is needed at all, instead of simply firing the drill beam from the Narada. According to the non-canon Countdown comic the Narada had been upgraded with Borg technology before Nero went on his crusade, explaining the size, the bizarre look and the formidable weaponry. A Romulan Bird-of-Prey and the T'Plana Hath appear as Easter Eggs aboard the Narada. The Swarm ships were left behind on the planet Altamid by an ancient civilization and reactivated by Krall. Each ship is equipped for just one pilot and a handful of passengers. They are built for atmospheric flight as well as interstellar flight. Thousands of Swarm ships can be launched from "racks" on Altamid for an attack. Usually operated by drones, the Swarm ships form a collective intelligence. 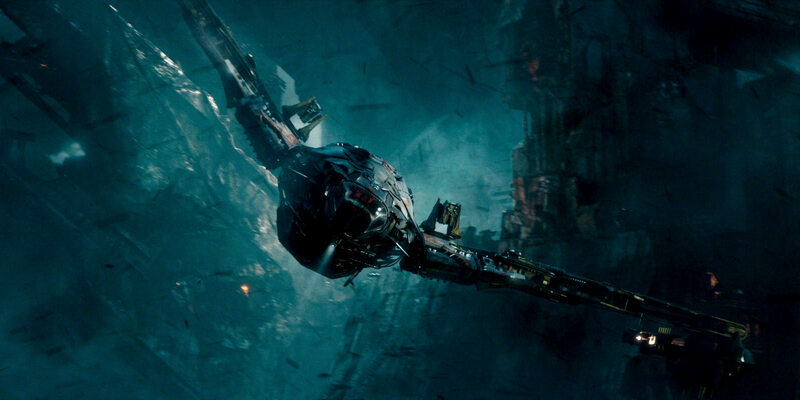 The Swarm ships are equipped to cut through the hull of a larger ship. "Star Trek Beyond" director Justin Lin says on the total size of the Swarm that he experimented with his visual effects supervisor Peter Chiang, starting with around 2000 ships, then 4000. “In the third act we ended up doing 250,000 ships. It appears that the Swarm ships were reddish only in the first trailer (especially when we can see three of them threatening Spock and McCoy), and their color was switched to gray for the final version of the film.